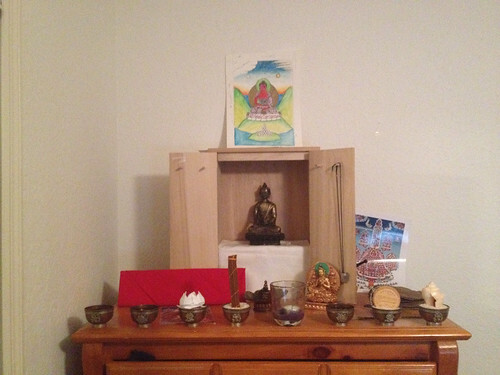 Thanks to a few good Dharma friends and online research, this is my Shrine as of now. The rupa of Shakyamuni was saved from an Antique show there many Dharma things were sold at a stand from China. Green Tara was given as a gift for inviting the Relic Tour. The Bowls were from a person feeling extra generous. The Incense burner was a gift from my girlfriend. Inviting Simple Practice, Simple as Nature. I like the cabinet style, alot of japanese people have shrines like that. I'm thinking of trying to find one like that for us since we are probably moving soon. Also- props for having the text on the right side! Fortyeightvows wrote: I like the cabinet style, alot of japanese people have shrines like that. I'm thinking of trying to find one like that for us since we are probably moving soon. Thanks! I made this cabinet when I was still practicing Zen so that's why it has a Japanese feel to it.